Quicksilver: No Surrender Review – AiPT! He’s a self-hating narcissist who just wants to be loved. Quicksilver is a jerk. Pietro Maximoff, brother to Wanda (AKA the Scarlet Witch) is arrogant, aloof and pissy with his teammates, and he has been for over 50 years. Whether it was in Magneto’s Brotherhood, the Avengers, X-Factor or anywhere else, he’s just not the kind of guy you’d want to rub elbows with, and he seems to like it that way. But maybe you can’t blame him. He had a tough upbringing, found his real father, found out that WASN’T his real father, and despite his super speed, he can’t seem to get away from the feeling his perturbed teammates wouldn’t like him so much even if he were nicer. I mean, it’s not like they’re doing that much to rescue him while he fights multi-colored energy demons in the moments between time. Such is the premise of Saladin Ahmed’s Quicksilver: No Surrender, spinning out of the surprisingly successful, weekly Avengers story of the same name. To get you up to speed (heh), Quicksilver had to run faster than he ever had before, with a magical assist from his sister, even, to … well, it doesn’t really matter why; it was a heroic thing and now he’s stuck in a hyper-fast world where time is all but stopped around him. EXCEPT for a bunch of varied, monochromatic somethings that look a lot like Pietro, but run around the world trying to kill the people he loves. It’s never quite explained what they are, but the symbolism is obvious enough. That’s all a little reductive, of course, and as always, it’s more about the singer than the song. Ahmed does a fine job making Quicksilver a three-dimensional character, though he still struggles with overuse of exposition, a common stumbling block for novelists-turned-comic writers. The insight is good, but the monologue ends up getting repetitive and, well, let’s just say the turtle bit doesn’t really land. Part of the problem seems to be that Ahmed doesn’t trust his artist, Eric Nguyen (with help from Paul Renaud in issue #3), to carry his end of the narrative. If so, he’s not completely wrong, as the individual panels aren’t really descriptive. It’s hard to tell what’s going on, especially in fight scenes. The arrangement and style of the panels, though, is kind of phenomenal, giving a real sense of movement at high velocities. That combined with the colors of Rico Renzi (with help from Chris Brunner in issue #2) make Quicksilver: No Surrender visually striking and unique. Each of Pietro’s “shades” has a different hue, and seeing them race around the otherwise grayscale world is evocative of Tron and Tetris in the best of ways. 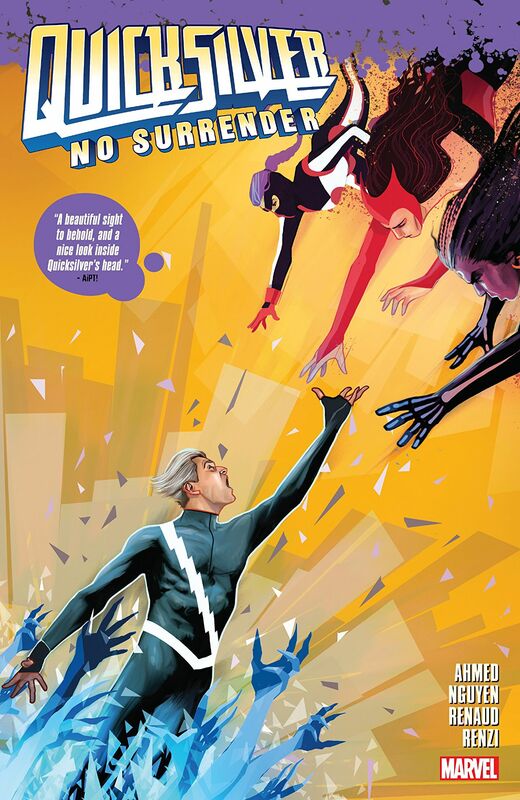 Quicksilver: No Surrender is not perfect, but it’s a good character study with both brilliant and frustrating art. Ahmed needs to ease up on the exposition, which of course is easier said than done when dialogue from other characters is so sparse. Still, he should have trusted the art team more, but the final package is pleasing, and fans of the character will love to see him shine. It's a nice character study with great panel layouts and colors, but iffy fight sequences. Too much exposition, but a difficult concept to pull off without it.